This porridge will become your favorite breakfast. It’s so easy to make and very delicious and creamy. It is called breakfast for a good reason, as we are literally breaking the fast from the night before. While your body is slowly waking up, it is best to start your day with a dense raw nutrient breakfast for a happy energetic day. Blend the celery and fruits in a high speed blender (like Vitamix) until everything is smooth and creamy. Add the toppings and enjoy at room temperature. This is a delicious smoothie that delivers nourishment and helps detoxify your body - all in one glass. Hawaiian Spirulina may help detox your body from heavy metals and the lemons may help your liver assist in this detox process. Instead of water we added coconut water packed with live enzymes and hyssop tea, a tea well known for its healthy components including tannins and flavonoids. Blend everything in a high speed blender (like a Vitamix) and serve immediately. Drink this smoothie on an empty stomach. * Watch Dr. Garcia‘s video how to open a young coconut. A raw and delicious smoothie with whole spices, good fats and packed with a lot of antioxidants. Add all the ingredients in a high speed blender (like Vitamix) and blend until everything is well mixed and smooth. Add all the ingredients in a high speed blender (like Vitamix) and blend until everything is combined and smooth. Top with organic whipped coconut cream and sprinkle with cinnamon. Enjoy at room temperature. Chaga mushroom is a great immunity booster that adds health benefits to this delicious smoothie. Chaga mushroom, also called "black gold" is a wild mushroom that grows on trees in the Northern Hemisphere. Chaga tea has been consumed for centuries throughout this region. 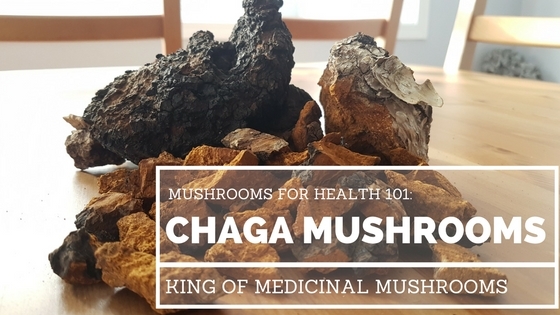 Chaga is loaded with impressive health benefits and is a good source of antioxidants. Boost your immune system by including chaga mushroom in your diet.